12 Pebblebrook Ct. Bloomington, IL - FOR SALE by Couillard & Co. This is a wonderful opportunity to own a move in ready home with a great view of the Den at Fox Creek! Spanning over 4000 finished square feet, this home has a beautiful floor plan that is great for entertaining! 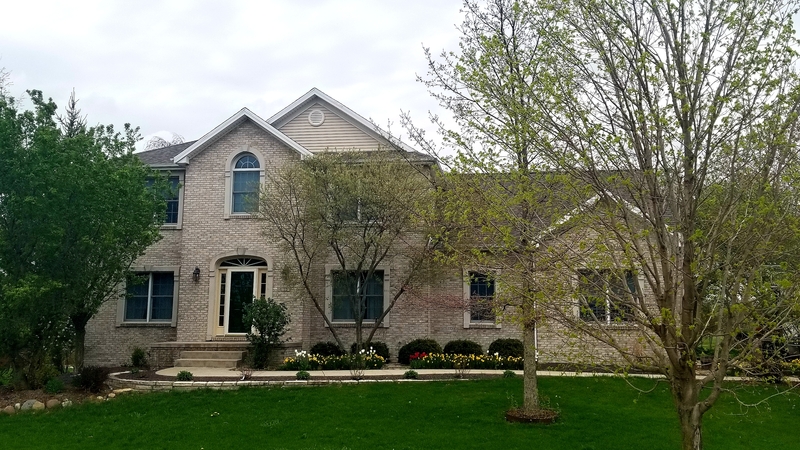 12 Pebblebrook Ct. Bloomington, IL 61704 has great curb appeal – head to toe white and grey brick, concrete walk way to the front door, five difference trees, bushes, and a deep driveway to the 3 car garage. Front entry offers nice foyer with tile floors and crown molding. To the right is a formal dining space with detailed ceiling and to the left is a formal living room, or in this case, office space. First floor family room offers tons of built in shelving and cabinets surrounding the fireplace. Open floor plan offers an easy flow into the eat-in kitchen. Bump out to the back deck offers great space for kitchen table and brings in lots of natural light. Kitchen counter has breakfast bar – enough seating for four! Upstairs you’ll find 5 bedrooms! Among those is a 15×15 master suite that features a soaker tub and separate vanities. Finished basement offers a second living space, bedroom, and full bath. This home also boasts little surprises such as heated tile flooring (basement bathroom), TONS of storage, and fruit trees in the semi-private backyard – Two Honeycrisp Apple trees and a bunch of raspberry bushes – and large deck with two staircase exits/entrances. All offers on 12 Pebblebrook Ct. Bloomington, IL 61704 are subject to state farm approval and should have approval letter from bank. Home is wired for ADT but seller does not have active service. Seller does not have the hoses for the central vac system. They have never used it.